The Darwinian Evolutionary Theory, is not only wrong but simple a no-sense theory. I am speaking about Human Evolution. And because we live here ... there are a part of us that were plants, other part that where laggards or reptilians, and across ... a lot of time, may be around 450.000 years we arrive to our actual position. I will not comment here the DNA Layers. I will speak about our four brains. These are also know today, but normal scientists. Let go on details ... a little bit. We have four brains: the reptilian brain, the mammalian brain , the human brain and the neocortex brain. 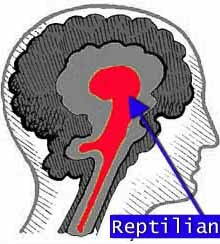 The reptilian brain is down low, at the base of your cranium, deep inside, protected and ancient. The reptilian brains know, it is instinctual. It listen to your body, perched right there close to your spine and neck and to the rest of your body. Your blood supply goes right through it. This brain is wise and gives you insights, as long as you listen to it. It knows touch, hot and cold, and wet and dry. It know what is good for it and what is not good for it. Mamalian brain. It sits above and wraps around the edges of your reptilian brain. It knows when you need to fear, and when not to, when to run, and when not to. It uses the power of sight and scent to find food and satefy; it uses the power of discernment to decide what action to take next. It warms when it has companionship with others. The human brain it is right there through the middle of your head, front to back, wrapped over your mammalian brain like a sheathing, like an insulation, like a second growth, a second thought, opening new possibility. It came about through thousand of years of discernment, and wanting to remember those discernments. It wants to store bits of information as food for thoughts, like a squirrel saving acorns in the ground. Notice thoughts; this brain has many of those. Brilliant bits of energy bursts, shooting through these circuits at close to light speed: thoughts. Then we have the neocortex brain. It is extra stuff in front, behind your forehead; you feel it like an energy burst there. It pulses when you have an especially brilliant insight or vision: It loves ideas and ideals -- the things you want to create, to see happen in your life or in the lives of those you know. Sometimes those ideals become real, and our neocortex warms our foreheads, causing our whole face to relax and smile to form on our lips. Like you see all this information 'start-to-be' available. But, because we have more access to more information, we comment to you in a new fashion way.